You could have the best outfit in town and the most well-rehearsed script in the country, but there are so many factors that go into a successful videocast that many people tend to miss. It could be the videocasting system they chose, the internet connection they’ve invested in, or even the very topic of the event itself. But did you know your body language could have a huge effect on how successful your presentation could be? If you’ve never given this any thought before, it’s time you started becoming more aware of some negative physical signals you may have been giving out all this time. 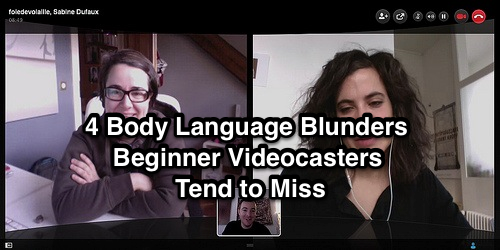 In this article, we’re going to give you a rundown of the most common body language blunders that newbie videocasters tend to make. This is one of the most common mistakes that beginners make. You may be nervous because of stage fright, but you’ve got to resist the urge to avert your eyes from your audience. Looking away from them implies that you are trying to hide something, according to an article by Forbes. It also makes you look like you aren’t confident about what you’re saying. If you look down while speaking, you end up looking self-conscious, too. If you can manage to maintain eye contact with your audience, you’ll instantly be able to make a connection with them. Though you don’t have to stare at your audience the entire time, try your best to at least look into some of your audience members’ eyes once in a while. In terms of a videocasting session, you’ll need to learn to look directly into your camera rather than on your screen to replicate the effect. It’ll help your audience feel more engaged with your presentation. It doesn’t matter whether you’re looking at a clock on the wall or a watch on your wrist. Glancing at the time while you’re talking to somebody (or, even worse, listening to somebody) makes you look impatient and rude. It sends people the impression that you feel like the conversation or event is a waste of time, and that you can’t wait until it’s all over. If you’re trying to keep track of how long your videocast is going, do so in a very subtle way. Better yet, practice your presentation and time it so that you know exactly how long you’ll be speaking. That way, you won’t have to worry about going over your allotted time, and you won’t accidentally watch the clock and turn your audience off. Another way to check the time more subtly is to keep a timer on your screen close to where your camera is located. It’ll be much less obvious, and can even help you ‘lock eyes’ with your audience. These may seem like innocuous gestures, but simply crossing your arms could already give your audience the feeling that you’re closing yourself off from them. Even if you’re doing corporate videocasting using tools like BlueJeans, people will notice how tense you look on the screen. It makes it look like you are guarding yourself, or that you don’t want to be open or vulnerable around other people. The same idea applies to when you cross your legs. No matter how much you smile or nod your head, the rest of your body will send them the signal that you don’t really trust the other people in the conversation. Try to keep yourself from crossing your arms, no matter how much of a habit it’s become for you. Get your friends or co-workers to watch you while you practice, and have these people point out any instance where you close yourself off using your body language. Whether you’re just sitting down or standing up, slouching is one of the most common ways to show people that you’re disinterested in them. It can make your audience feel like you are disrespecting them, too, according to an article on LinkedIn. Instead, try your best to keep yourself standing straight with your shoulders back. These types of poses are called power stances, and they can help you exude an aura of confidence. On the other hand, slouching makes you take up much less space, which then makes you project much less power in the end. Yes, your audience will be able to tell if you’re sitting up straight in a videocast, too, so make sure you mind your posture while you’re presenting online. Don’t let your videocast be ruined just because of a few badly timed gestures or expressions. Being aware of these mistakes is the first step, but you need to actually act on eliminating these bad habits completely. Remember: practice makes perfect, so the sooner you start practicing your presentation, the better. Good luck on your next live interactive event!